I hadn’t intended to blog again quite so soon but today’s goody bag has inspired me! Not that I’m complaining about this particular goody bag, its contents were generally fine but there was just one item which made me ponder. 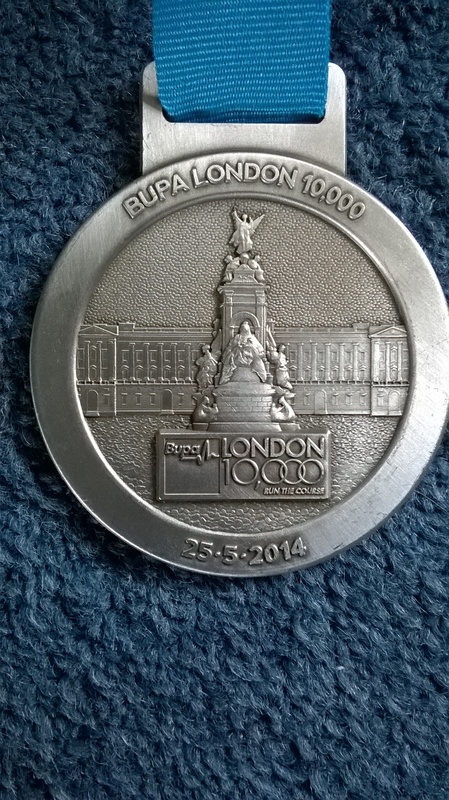 Obviously there’s my medal, nice one this year with a map of the route and the actual run date. I will have to delve around my collection to see if previous years’ medals had so much detail but I think not. The Route – Sort of! A nice screwed up run T-shirt, good for providing layers when the colder weather comes back. A couple of BUPA leaflets offering discounts on specific services including fitness assessments. I thoroughly recommend this particular assessment. The one I had last year was worth every penny – oh, no, I didn’t pay for it did I! The Daily Telegraph did! Oh well, if I had that sort of money splashing about, it would be worth every penny! I certainly came away feeling pleased with myself. A bottle of sports drink and a bottle of water, one consumed very rapidly. Various sweets/biscuits/cereal samples to help replenish the carb stores. I’m sorry but no one’s ever going to persuade me that Belvita biscuits are tasty, the yoghurt based ones remind me of custard creams and I never liked them as a child. Today’s I think was supposed to be chocolate chip – there were brown lumps in it anyway! A bottle of alcohol free beer from Bavaria. The tin is so small, a couple of swigs should probably finish it off. A sample of Jointace Gel – gotta love a bit of Jointace Gel, I swear I get a bit high on the smell of eucalyptus. A bottle of chocolate (non dairy) milk – is it supposed to have lumps in it? The use by date is okay and I know everybody swears by chocolate milk for recovery but I’m a bit worried I may have to cancel my clients tomorrow because I’ve got the chocolate milk squits!! 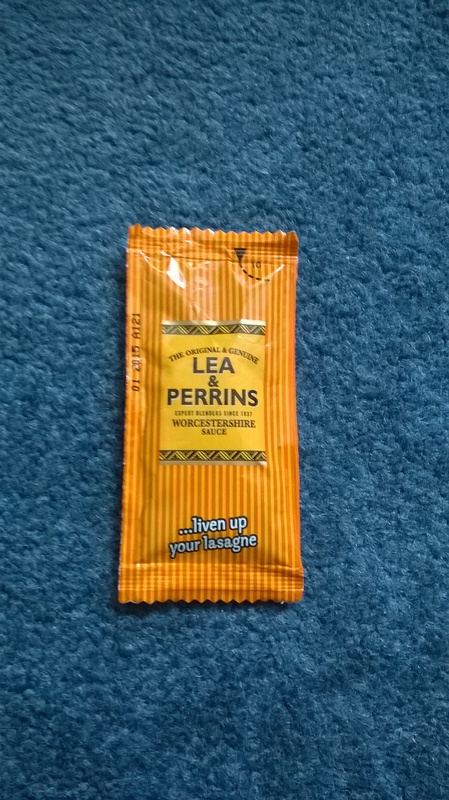 And finally, the pièce de résistance – a sample of Lea & Perrins Worcestershire sauce, handily attached to a recipe card for spag bol. What do you think I’m going to do, dash home from the run and cook an Italian meal?! There’s usually something salty in the goody bag to encourage you to drink and therefore rehydrate but I’m hardly going to sit on the train swigging Lea & Perrins!? Please don’t think I’m being ungrateful, I love all my little gifts but this one was just a little strange. Anyway, might as well mention the run while I’m here. I won!! No, you’re right, I didn’t but I achieved both my goals. Over 2 minutes off last year’s time to get a new course PB of 56 37 and I didn’t walk. My pacing strategy didn’t quite go according to plan but it was more or less correct. I admit it did get a bit tough towards the end but I refused to give in. 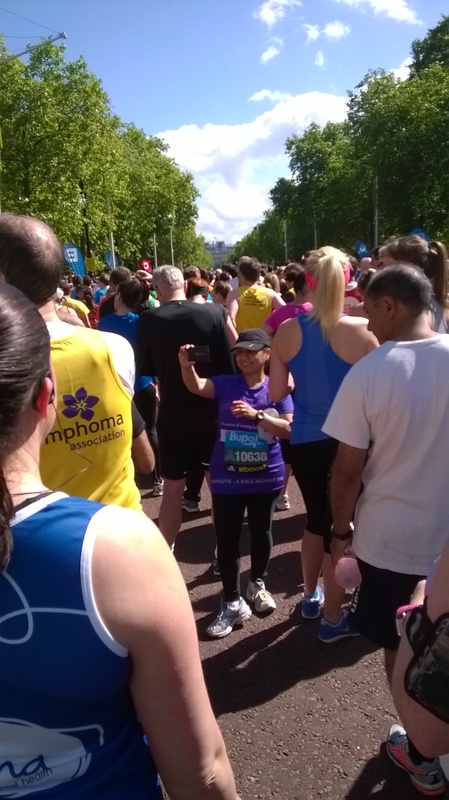 I think the first time I did this run I had to walk about 500m before the end – that was not happening this year! And I saw Mo even though he wasn’t running. He was starting the run as he had decided to give someone else a chance of winning. Where’s Mo, I can’t see Mo! 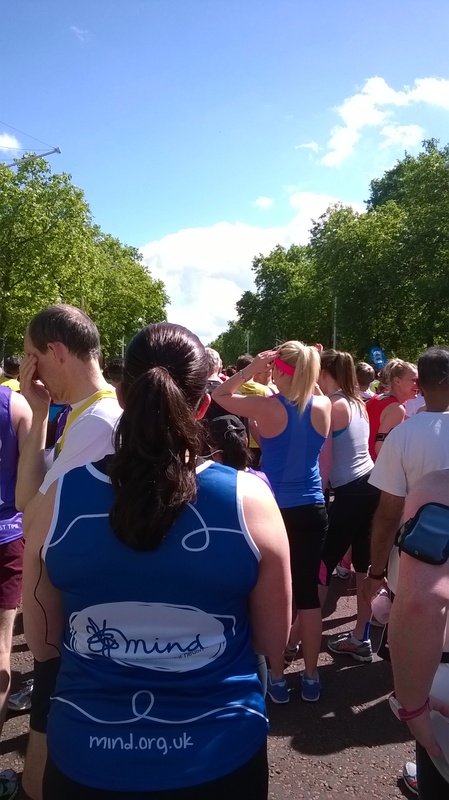 So tomorrow I start training for my next run – the City of London Mile! I think the walk from the station to the start will be longer than that but it’s the inaugural run and I like being in at the start of things. But now, I’m going to lie down!! It’s been a few weeks since I posted anything on my blog, probably a reflection of the fact that not a lot of running has been undertaken. My last post was about passing my open water swimming Brownie badge, I mean assessment! And I’m glad to say that we have been back – twice! And the even better news is that the water is getting steadily warmer. We’re hoping that, by the end of the summer, wetsuits will no longer be required and the bikinis can come out – joke! So since the initial assessment new fluorescent swim caps and replacement goggles have been purchased and we have been venturing further and further out into the lake at Leybourne. We have also been swimming with the ducklings who don’t seem at all put out by the sight of fushia pink or electric blue human heads bobbing up and down around them. There is something rather edifying about being surrounded by nature while you “exercise” whether it be the geese flying overhead or the ducks gliding smoothly by. Mind you, whose legs are paddling more frantically under the water – theirs or mine?! Last one in is a sissy! Anyway, back to the running, or lack of it! Injury is not to blame, nor time and opportunity, not even enthusiasm. It just seems like the past few weeks have been “low mileage” weeks. And I know downtime is advised and can often result in renewed vigour – let’s just hope tomorrow proves this to be the case. 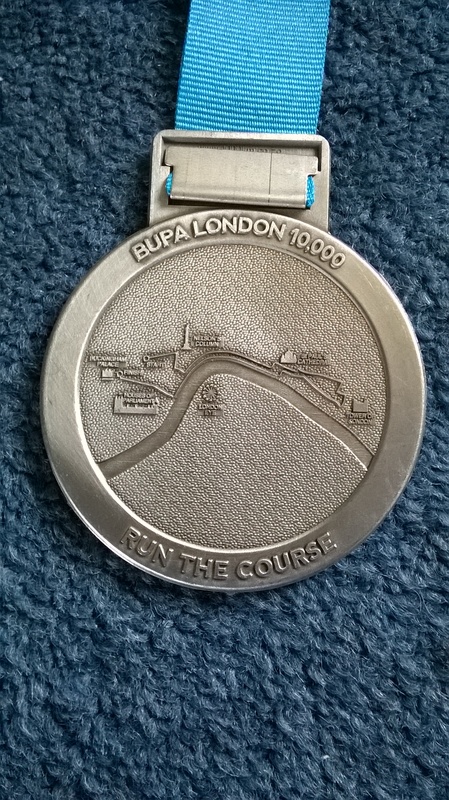 For tomorrow brings my next run, the BUPA London 10,000. Fourth attempt and fingers crossed, this one will be my best yet. 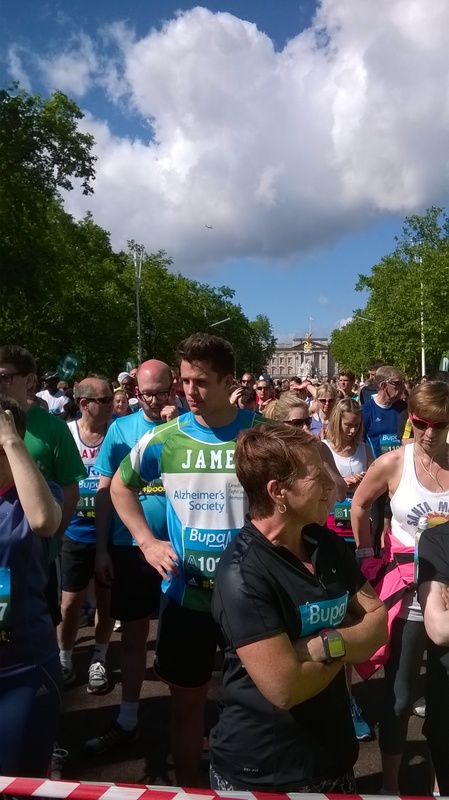 Goals – PB and no walking – although I am just a little worried about the incline as you come up from the underpass on to the Embankment at around the 7k mark. I seem to remember this was my undoing last year. Still, I have my pacing plan in my head and I practiced it on Monday, albeit only up to the 7k mark, but hopefully I can carry it on to the end. And this year, I will not be running against my foe – Mo! He’s chickened out of our annual meet. Apparently Mo has only just started “jogging” again after his marathon a month ago. Let’s be honest, even if he did jog it, he’d still beat me! But I shall miss seeing him as I set out on my run and he concludes his. Hopefully he’ll be back next year but in the meantime I look forward to passing Chris Thompson and Andy Vernon. Yes, alright, passing as in going in the opposite direction! Wednesday afternoon found me standing in a Kentish lake in a wet suit up to my armpits in freezing water. It reminded me of some song lyrics, notably Clean Bandit’s Rather Be – “We’re a thousand miles from comfort”. Okay, maybe not a thousand but certainly ten. The long journey to the lakes at Leybourne was accompanied by a fair amount of nervous joking between Alex and me, although my “let’s go right around this roundabout and back again” wasn’t necessarily a joke. En route Alex informed me that wet suits don’t actually keep you dry. The idea is to allow some water inside the suit to build up a warm barrier between you and the cold water outside. I was also enlightened on one of the methods of sourcing this “barrier” and it’s only because I’ve had this fact subsequently confirmed by a few other people that I’ve realised it wasn’t just Alex winding me up! I had spent most of Wednesday morning dashing up and down stairs to the loo because I knew I would have a few problems needing a wee in a wet suit – I needn’t have bothered! Because, dear reader, apparently it is perfectly acceptable to wee in your wet suit. In fact, it is positively encouraged because this helps to provide the warm barrier!! So we arrived at the water sports centre and I was trying to appear quite nonchalant, “Oh yeah, I do this sort of thing all the time”. Then I encountered the first problem – adorning the wet suit. Paula from the centre sorted out our suits and then started to tell us how it’s much easier to put the suit on if you use a carrier bag. Now Alex appeared to know exactly what she was talking about while I was looking around trying to find the hidden camera. She’s definitely winding us up isn’t she? Alex goes off to her cubicle while I have to confess that Paula’s really going to have to run that by me again, I really am having problems trying to visualise what she’s saying! Ah ha! Once she’d demonstrated it all made perfect sense! You put the bag over your foot and then it slides into the suit much easier. What she didn’t say was that having inserted one leg into said suit, it’s a bit of a nightmare trying to retrieve the carrier bag while standing on one leg in a slippery floored two foot square cubicle without falling over. God my core muscles must be strong!! Suited and booted and clutching our fluorescent coloured swimming caps (so we can be spotted out at sea, by satellite and more importantly by the safety boat), we emerged into daylight and met up with the other three intrepid open water novices. We perched on a bench for our initial safety talk. Amongst other things we learned was that a half Mobot indicates we’re okay, whilst a frantic wave while floating on our backs means we aren’t! Finally we ventured very slowly into the water, having been informed just beforehand that its 14.5 degrees today. “Oh goody!” I thought. When we were here last week it was only 13.5 degrees! A whole degree warmer!!! We gradually crept further and further into the lake, legs first, then body and then we had to dip our head in the water – aaaaargh! And during all this our instructor was explaining how best to focus on the buoys and how in some parts of the lake you will find yourself swimming over the boat with the skeleton on board or possibly the rusty car. I think it was at this point that my mind fleetingly thought “I don’t want to do this, I think I want to get out.” But I faced my fears and we set off in convoy for the first buoy and then trod water waiting for everyone to catch up – okay, they were waiting for me to catch up! It didn’t seem to matter how many strokes I’d done, I just didn’t seem to be getting anywhere. Disrobing was every bit as awkward as putting the suit on although this time carrier bags were not required – except to put my wet swimming costume in! Then the big question arose on the short journey home. Were we going back? Hell, yes! 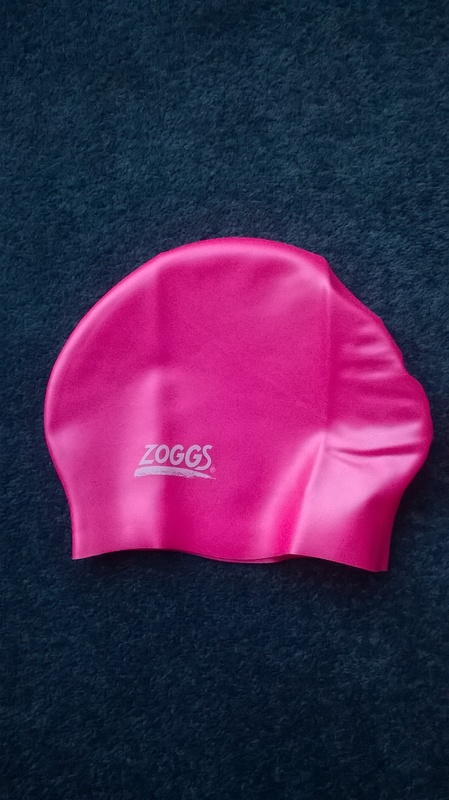 I’ve just invested in a bright pink swim cap – I did threaten to get the Peppa Pig version but I think I might have been going on my own. So we are prepared to brave the cold, Weil’s disease and Swimmers Itch (?!!) and our plan next time is to combine a morning run around the lake followed by a swim in the lake, ie, a duathlon but in reverse. You’ll spot me in this! 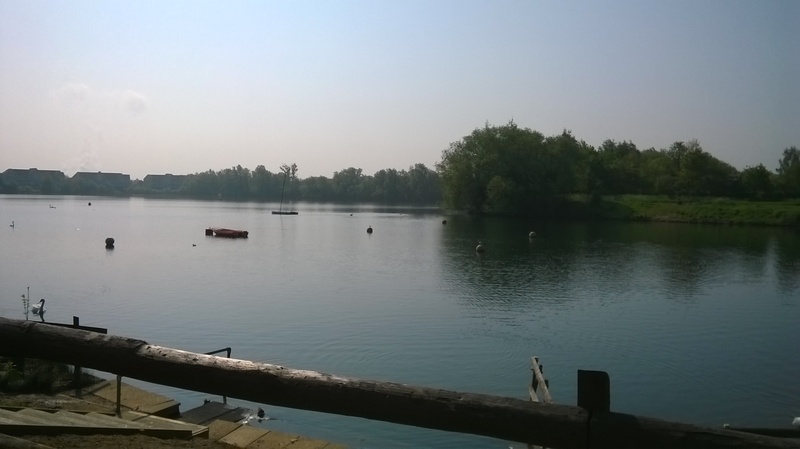 My latest mad cap adventure – an open water swimming assessment! How did that happen? I’ll tell you how. I am very easily led by one Alex Welch! http://magazinecollage.com/ It was all her fault I ended up doing the London Marathon. Alex told me about the ballot process and then proceeded to stop entering her own name while muggings here carried on and got the bug! 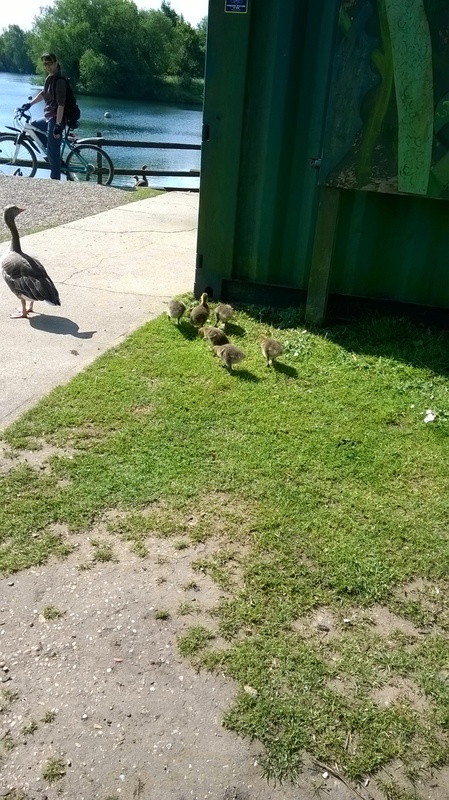 The water sports centre didn’t open until 10am so we whiled away the time by jogging around the lakes trying to impress other park users with our energy levels. Secretly I was looking for a cafe for a quick shot of caffeine but alas, none was to be found. After our second lap we found ourselves back at the centre only to find it still shut. A second reading of the opening hours revealed that it didn’t open on weekdays until May – damn, one day too early!! After a bit of stretching and with the sun beginning to emerge from behind the clouds, we decided to cut our losses and just do one more lap before heading back. I should have urged for heading back there and then! As we came around the last bend I spotted the centre had now opened, so we trotted over and Alex started making her enquiries. “£30 one off fee, blah, blah, blah, wet suit included, blah, blah, blah, 400m out to the catamaran, blah, blah, blah, safety boat, blah, blah, blah …” While Alex was asking questions and sorting out a convenient date, I was standing there looking out at the catamaran thinking “I could do that, surely”. And the rest as they say is history, Jones had put her name down on the list. Now that a few days have passed, I’m beginning to have doubts. 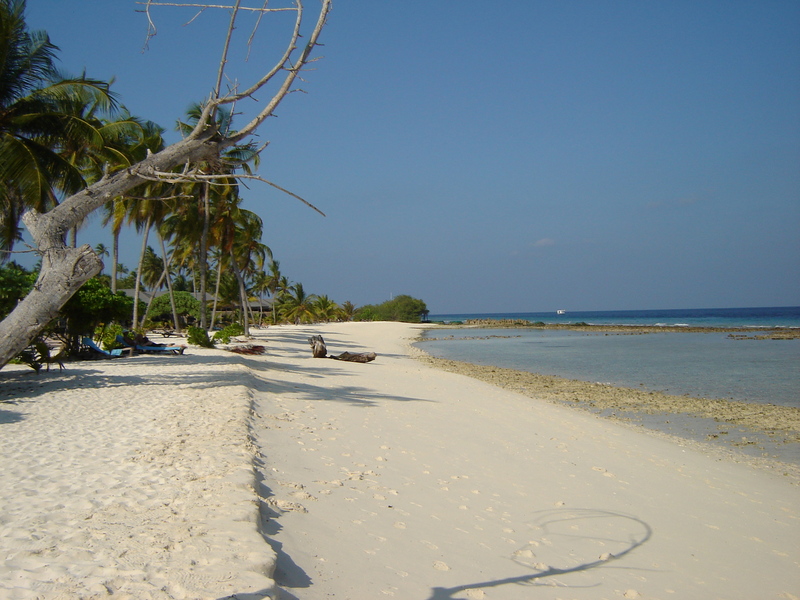 I do not exaggerate when I say the last time I swam was three years ago, in the Maldives! Snorkelling in waist high warm tropical water is a smidge different to wet suiting in a cold dark lake in Kent. I seriously need to get myself down to a swimming pool to see how aqua unfit I am. Yes I run but I know from previous experience that swimming requires a different sort of fitness and one length of the pool will probably find me gasping for breath with burning lungs. And is there any form of wet suit etiquette? Do I need any inoculations? Although the website describes the lakes as “freshwater”, is it guaranteed that I won’t pick up any nasty bugs when I swallow gallons of water?